Welcome to Japan, the Gods and Goddesses’ Country! | Think the Unthinkable Future. Welcome to Japan, the Gods and Goddesses’ Country! In Japan, a series of holidays called “Golden Week” has just begun. As a start-up, I usually worked even during holidays to give instructions my colleagues, however, a few years ago, I suddenly became aware of the fact that ordinary Japanese people don’t come up to the internet any more on weekends and holidays. Since my business partly depends on volatilities in web marketing, I totally changed my work style. Instead, I don’t “physically work”, but “psychologically work” on weekends and holidays, as I’m writing to you, dear readers, on my English weblog. This time, I’m heading to the Izumo shrine in the Shimane prefecture. This is the third time for me to pay a short visit to there. Every time I step forward to the next phase of my life, I visit either the Izumo or Ise shrine. I don’t know why, however, I just feel I’m obliged to do so as a human being living in this country, Japan. Maybe, my foreign friends and colleagues can’t understand what I mean by saying such an odd thing. Because it’s beyond description and any logics of western styles, What I can tell you is only “Feel it and then go to pray at shrines”. It’s not logic but feeling that matters in depth of the Japanese spiritual culture. 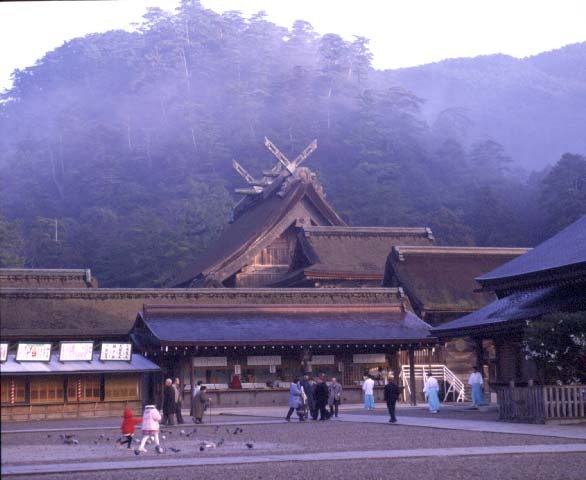 Typical explanation on these leading shrines in Japan usually begins with the explanation on their origins which go back to two different tribes called “Izumo-tribe” and “Ise-tribe”. The former was conquered by the latter, while the former was symbolized with its peaceful and voluptuary way of life. Because the Ise tribe’s power obviously surpassed the Izumo’s, the Izumo’s was forced to move to other regions than where they had lived from the very beginning of its civilization. …At least, connoisseurs of the ancient time in Japan always love to tell us such a story. All the things are to be made complicated from this point, to be honest. A wise man recently sent me a brochure and DVD with a message that not Izumo plus Ise but “Tokushima” that originated the Japanese ancient history. By saying, “All the ways actually began from Tokushima”, he and his colleagues argue mainly based on scientific study of the Japanese language that all the names of important shrines and districts in old Japan have been concentrated in Japan. This fact is said to be the very proof to say that the original Gods’ and Goddesses’ land was situated not in other regions but in Tokushima, where only few Japanese even travel to. To wrap up, I just want to say Japan is really the country of enigma. Even though you get into her society and history deeper and deeper, you never get to her origin. Never ever. This is why other nations love and hate her, I know.